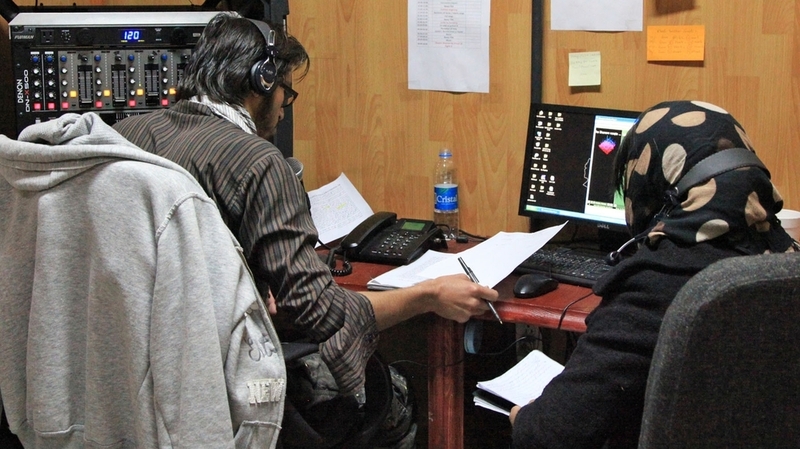 Unidentified Afghan civilians broadcast a radio program from the radio studio at Forward Operating Base Shank in Logar province, south of Kabul. The U.S. military is training Afghans to disseminate anti-insurgent messages via local radio. From the outside, this white metal container looks like all the other mobile structures at Forward Operating Base Shank, the main NATO base in Afghanistan's Logar province. But rather than housing soldiers, offices or latrines, the building contains a fully functioning â" if spartan â" radio studio. It's known by the U.S. military as a RIAB, or "radio in a box." But the Afghans, says DJ and presenter Saifitullah, call this station Unity Radio. It broadcasts daily from 6 a.m. to 10 p.m. to the surrounding provinces, and Saifitullah says the station gets calls from listeners some 30 to 40 miles away. "We have different shows in this radio station, including political shows and also some recreational music and also messages," he says. The enemy recently went to a school ... They told the students that the ANA are not good people, because they are cooperating with the Americans. So, we have to counter this propaganda. The propaganda messages are usually from the Afghan National Army, or ANA. "The main focus of these messages is to tell the local people who the enemy is, and that the enemy is supported by people from outside Afghanistan," says Col. Hayatullah Mamond, one of the chief message writers. Mamond, who is with the Afghan Army's 4th Infantry Brigade, says there are also messages that target insurgents, calling on them to lay down their weapons and join the peace process. "We tell them that fighting is not the answer," he says. "When there is peace in a country, there is development and jobs and people can live in prosperity." Maj. Topal Wared fills the relatively new position of information dissemination officer for the 4th Brigade. He's charged with gathering information from locals in areas patrolled by the Afghan Army. Wared also researches Taliban propaganda and prepares counter messages. "For example, the enemy recently went to a school in Maidan Warak District," Wared says. "They told the students that the ANA are not good people, because they are cooperating with the Americans. So, we have to counter this propaganda." Maj. Chris Lawson, information officer with the U.S. 173rd Airborne Brigade Combat Team, has been helping the Afghan National Security Forces, or ANSF, since June. "Initially, we were doing coalition-led messaging," Lawson says. "Then, about a month or two in, our brigade commander said from here on out he wants all ANSF messages." And the Afghans are increasingly self-sufficient, Lawson says. In addition to the Radio in a Box, the Afghans can interact directly with the people and deliver messages face to face. That's important in a culture with a strong oral tradition, he adds, and where there are not a lot of TVs or radios to go around. "When it's time for us to leave, I think they'll be able to sustain that," Lawson says. "But they need to start relying more on the local media." That's because the U.S. assets are disappearing amid the drawdown of forces. When he arrived in June, Lawson had nine RIABs in Logar and neighboring Wardak province. Now, he says, they are down to four. The most difficult part of the equation is determining whether the radio messages, like one calling on young people to join the security forces and fight the foreign-backed enemies, are getting through and making a difference. "Since I've been here, I haven't done a study of how many people in whatever village listens to these RIABs that we have," Lawson says. So with coalition resources dwindling, getting the message out â" and ensuring it's actually effective â" is just one more challenge the Afghans must face as they confront the ongoing insurgency in Logar.